Ryan Lochte finished his weekend at the Mel Zajac Jr. International by winning the 100 freestyle and finishing second in the 100 backstroke. In the 100 freestyle UBC Dolphins’ Kelly Aspinall took the early lead turning in a time of 24.64, he was followed closely by Lochte, UBC Dolphins Tommy Gossland and Cascade’s Joel Greenshields. 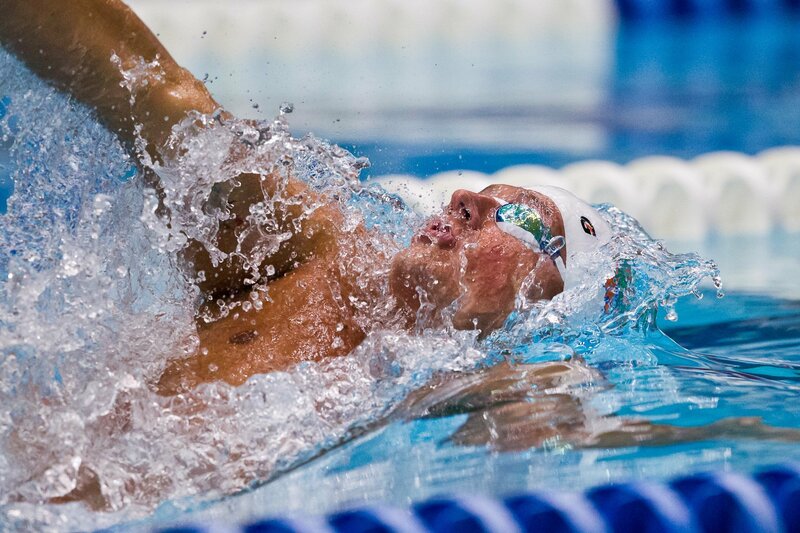 Lochte took control in the second 50 meters eventually winning the event in a time of 50.97. 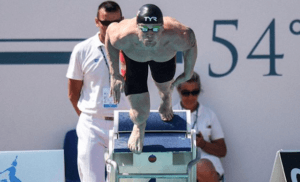 Greenshields who was a 2008 Olympian and will be swimming the 100 freestyle in Barcelona finished second in a time of 51.37 with Gossland finishing third in a time of 51.46. Russell Wood of the Cascade Swim Club lead the men’s 100 backstroke from start to finish winning the event in a time of 56.14. Lochte finished second in a time of 56.22 followed by the University of Calgary’s Gleb Suvurov, who beat Lochte in the 50 backstroke on Saturday night, finished third in a time of 56.43. UBC Dolphins’ Savannah King took the women’s 800 freestyle in a time of 8:39.20. King was challenged the majority of the way by ESWIM’s Brittany MacLean, who was within 18 one-hundredths of a second of King at the 400 meter mark. In the second half King increased her lead to over a second and a half at the 600 meter mark extended that lead over the final 200 meters. MacLean was challenged by Club Wolverine’s Emily Brunemann who made a push in the final 100 meters to catch MacLean, but ultimately fell short. MacLean finished second in a time of 8:41.17 with Brunemann finishing third in a time of 8:41.71. The University of Calgary’s Tianna Rissling and Fiona Doyle took the top two spots in the women’s 50 breaststroke. Rissling won the event in a time of 32.09 while Doyle finished second in a time of 32.25. UBC Dolphins’ Tera Van Beilen, who won both the 100 and 200 breaststroke earlier in the competition finished third in a time of 32.36. Rissling, Doyle and Van Beilen finished in the same order in the 50 breaststroke earlier in the year at the CIS (Canadian Interuniversity Sport) Swimming Championships. By winning the men’s 50 breaststroke Simon Fraser Aquatics’ Andrew Poznikoff swept the weekend’s breaststroke events. Poznikoff won the event in a time of 29.04 followed by the University of Calgary’s Jason Block who posted a 29.17 and UBC Dolphins’ Sergey Holson who finished third in a time of 29.57. In the women’s 200 butterfly 15 year old Emily Overholt of the West Vancouver Otters set the pace taking out the first 100 in a time of 1:02.97, she was followed closely by UBC Dolphins’ Noemie Thomas who split a 1:03.33. It was at that point that Thomas took control of the race eventually winning the event in a time of 2:12.82. After trailing Overholt by almost three full seconds at the halfway mark Haley Black of the Prince George Barracudas finished second in a time of 2:17.12 with Overholt finishing third in a time of 2:17.16. The men’s 200 butterfly was won by Hyack’s Stefan Milosevic in a time of 2:05.40. He was followed by Jon McKay of UVIC-PCS who recorded a time of 2:05.72 and Cascade’s Thomas Jobin who finished third in a time of 2:07.27. Natalie Hinds lead the women’s 100 freestyle from start to finish, winning the event in a time of 55.50. She was followed by Sinead Russell who posted a time of 56.61 and King Aquatics Ashley Sutherland who finished third in a time of 57.02. Sinead Russell took her second event of the competition winning the women’s 100 backstroke in a time of 1:01.24. She was followed by King Aquatics Hannah Weiss who finished second posting a time of 1:02.17 and Ellese Zalewski who finished third in a time of 1:03.16. In the final individual event of the weekend Edmonton Keyano’s Kier Maitland won the men’s 1500 freestyle in a time of 15:50.77. He was followed by Cascade’s Sean Penhale who posted a 15:56.35 and King Aquatics Jerad Kaskawal who finished third in a time of 16:02.73. I’d start watching for Natalie Hinds to make a huge breakthrough this summer. She didn’t have an OT cut in the 100 free before coming to Florida. Her OT cuts were in the 50 free and 100 fly. She came to UF with a best of 58.6, went a 57.0 earlier this season, and now is down to 55.5 with taper for Nationals yet to come. Her best in the 50 free entering this season was a 26.3, and she went a 25.8 here. Remember, this team has huge drops at taper time. I agree. I didn’t know what to expect from her in long course but her times here are very promising. her growth is scary in the best way! Even for Ryan Lochte those were horrible mid season times. 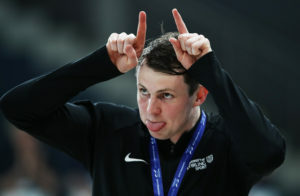 Will be curious if he can bounce back after his taper. I was reading the Brit tabloids & Ryan got a pic of himself in his short swim shorts . He was inserted in the celebrity column but unfortunately it was declared he was fat & had chunky thighs. That is what happens to famous people! honestly, there was really pretty bad swimming in lots of meets by lots of pretty good swimmers the past 2 weekends. maybe santa clara will be better. She made the trip, but sounds like they held her out for a minor (non swimming related) injury. Nothing that should be a long-term issue.